As I write this, the New Year is only a couple of days old and the hope for a 2017 that is filled with less violence, war, and human suffering than in 2016 is strong. As a NAFSAN who has spent time in countries torn apart by war or with a long history of oppression, I share the belief of many other NAFSA members that our work makes a difference in finding a path to a more peaceful and just world. For the fourth year, the NAFSA annual conference will include a Seminar on Peace and Global Civil Society. Originally named after former NAFSA president Ron Moffatt, a strong supporter of international education as one path to peace and social justice, this year’s seminar will explore how to incorporate film and other forms of storytelling into the curriculum. 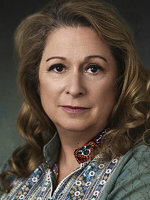 Since NAFSA plenary speakers complement conference themes and programs, the selection of Abigail Disney as our closing plenary speaker is an excellent choice. Disney and her production company, Fork Films, have supported more than 50 films that stress themes representative of NAFSA’s values of peace building, human rights, and social justice. My academic discipline is communication and my background includes the study of rhetorical theory. Several of the major theorists we study and teach explore the role of narrative as a powerful persuasive tool. Abigail Disney’s films are proof of that power. I recently watched her 2008 documentary Pray The Devil Back to Hell about the women’s peace movement that helped bring an end to the civil war in Liberia. The film’s website describes it as “a compelling testimony of how grassroots activism can alter the history of nations.” The film tells the story of the Woman in Peacebuilding Network (WIPNET) through its leaders, including 2011 Nobel Prize Laureate Leymah Gbowee. But it isn’t just the film’s ability to tell the story of the women’s movement that impressed me, it was also the fact that the women shared their narratives of living in a war-torn country with one another to form the bonds of solidarity that gave them the strength to confront the country’s president and move the nation toward peace. The story of thousands of ordinary women who brought young and old, rich and poor, Christian and Muslim together in a common goal to end their country’s suffering, demonstrates why we should use film in our classrooms and why narrative accompanied by graphic visualizations of the human condition can compel us to action. Abigail Disney has found ways to capture stories on film and weave them in ways that help us better understand the human condition. Her body of work is a testimony to why what we do is important—ordinary people can and do make a difference in the world. I am eager to hear about her experiences as a producer and director and about what motivates her to select the subjects she highlights. There is no doubt in my mind that she will motivate all of us to use film and storytelling in new ways. experience. We hear the stories of our students who venture outside their comfort zones to study abroad and how it changed them. And we follow the stories of those students who have used their international education experiences to change the world. Once again, NAFSA has selected a plenary speaker who truly does speak to where we live.